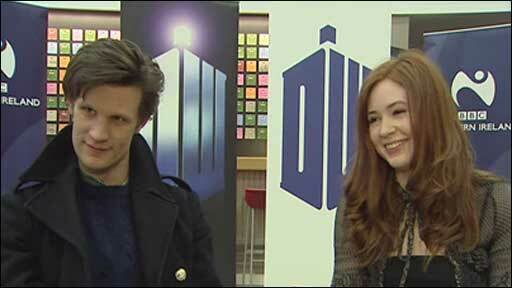 Northern Ireland fans of Doctor Who got the chance to quiz the new doctor, Matt Smith, and his assistant, Karen Gillan, when they dropped in to the BBC in Belfast on Monday. The timelord returns to television screens this weekend and viewers will be keen to assess the talents of the eleventh doctor. Matt told Good Morning Ulster listeners how the part had got under his skin since learning his audition had been successful. "I felt very special, I felt very privileged," he said. "I couldn't tell anyone for three months, but I listened to Frank Sinatra for a couple of days. "I felt on top of the world, I didn't really know how to compute it." The visit was the first stop on a tour of the UK before the new series starts on Saturday. The 27-year-old actor said he did not plan to draw on the influences of the ten previous doctors but hoped to do something "completely different" with the role. "I don't think it is ever conscious that you borrow bits of other people's performance, whether or not there are shades and flavours of other doctors in there I don't know," he added. "I particularly liked Patrick Troughton (former Doctor Who) - I think he is rather wonderful - but it is completely spontaneous and new to me." Karen Gillan said she was "too young" to appreciate the older Dr Who material, but admitted her mum was a "huge fan". She said any woman prepared to be the Doctor's assistant was not a "wallflower". Matt, who wants to add a hat to a costume which includes a vintage Harris Tweed jacket, said viewers could expect an exciting mixture of new and old monsters in the latest series. "The weeping angels will be making a reappearance and the daleks," he said. "But wait until you see what the daleks have done - it is quite impressive." The first episode of the new series of Doctor Who will be on BBC One on Saturday, 3 April, at 1820 BST.